Patna Pirates defeated Gujarat Fortunegiants 55-38 in the final of Pro Kabaddi League 2017 at the Jawaharlal Nehru Indoor Stadium in Chennai on 28th October 2017. 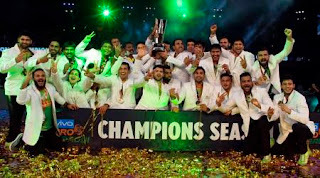 Pardeep Narwal scored incredible 24 points to steer Patna Pirates to third consecutive Pro Kabaddi title. Pardeep, who had scored 76 points in tthree playoffs, helped Patna come from behind and thump Gujarat Fortunegiants 55-38 in the summit clash of Pro Kabaddi season 5. Fortunegiants took initial lead before Pardeep’s back to back successful raids gave Patna a 21-18 lead at halftime. While the first half saw an equal context between the two teams, second half was completely dominated by the Pirates. Debutants Gujarat, who had made it to the final with a thumping win over Bengal. Pardeep continued his rampant form in the big match and picked up points at will in the important clash against the sturdy Gujarat defence.